97 Motel Moray is the closest motel complex to the Octagon, the centre of Dunedin City, surrounded by great city shopping, restaurants, cafes and bars. We have 40 modern units, including standard & executive studio units and one & two bedroom units. We have ground floor units as well as units in a multi story building serviced by a lift. Free on-site parking for registered motel guests. 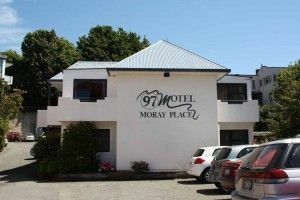 97 Motel Moray is an ideal central location to stay while attending Graduation Ceremonies, Conferences, Weddings, Concerts, Theatres, Art Gallery, Hospitals, on Business or just a day's shopping in Dunedin City. Experience Dunedin's Natural Heritage through a wide range of stunning attractions from Larnach Castle, Yellow-Eye Penguins, Albatross Colony, Olveston House and Taieri Gorge Railway to name but a few all on our doorstep.